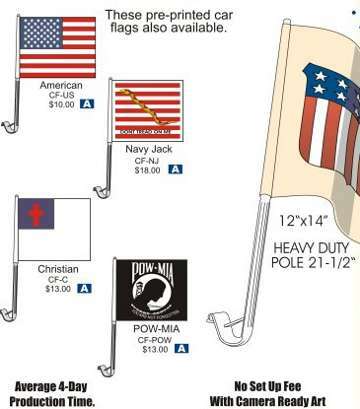 Economy Custom Christian and Patriotic Car Flags with fast production, at the lowest prices in the USA . Our customized car flags clip easily over car windows. We supply both 1-ply (one side) or 2-ply (two side) custom Christian and Patriotic flags with as many imprint colors as you want, including full color imprint (photo car flags). The 2-ply flags may show the same or different imprints on each side. Unit prices below include your 1 or 2 color custom imprint. Add the amount shown for each extra color (third, fourth, etc. colors). Setup Charge: $25.00 per color. Pole length: 17.5” flex poles, included in price: will bend at high speed. Contact us for the price of unbreakable stiff poles. Flag material: 100% denier polyester polyester. Colors: White, Yellow, Gold, Light Blue, Royal Blue, Navy Blue, Purple, Bright Red, Dark Orange, Maroon Red, Brown, Bordeaux Red, Green, Petrol Green, Dark Green, Black. Pole construction: flexible unbreakable plastic, stiff unbreakable plastic, detachable. Production Time: 5-15 days after art approval.